If you live in South Boston or are thinking of living here, you're in luck: With early access to new ultra luxury condos, 14 West Broadway offers unbeatable value when it comes to living in Boston. Slated to be completed in 2017, 14 West Broadway features all the amenities you could possibly want living in the city: valet garage parking, 24 hour concierge and security, movie screening room, gym with lap pool and a green rooftop terrace with a dog park where your furry friends can roam free. In addition to all that, you get amazing, unobstructed city views that are sure to please. Spanning 11 stories and 47 units, the price will range between $750,000 and $3,950,000 for these currently-under-construction ultra luxury condos. Close to the T, Starbucks and many other excellent restaurants and bars, you're never too far from the action. With convenient access to the newly developed Ink Block in the South End, Boston's Downtown and Back Bay, you could save on parking and commuting costs in a major way. Elevated Realty is proud to provide Buyer Representation for 14 West Broadway. Conveniently located in South Boston, 14 West will be constructed on the former site of the Cornerstone Pub, which sits right across from the MBTA’s Broadway Red Line station. Coincidentally, this is close to the start of South Boston’s annual St. Patrick’s Day parade, formerly known as the Broadway Tunnel Cafe, built in 1939. Thomas Flaherty, Sr. and John “Dudy” Flaherty bought the property in 1979 and renamed it the Cornerstone. There's lots to be excited about nearby for the future, with separate plans for a 156-room hotel for the parking lot at 6 West Broadway, plus a six-story, 31-unit apartment building proposed for 22-26 West Broadway, right next door to the Cornerstone. In addition to that, the building at 28-30 West Broadway is now for sale and promises great things. South Boston offers a diverse living experience. Hugging the Boston Harbor, the South Boston waterfront area is just one of the perks you have access to, living at 14 West. From the beautiful Institute of Contemporary Art (ICA) to Seaport Square, a stroll along the water brings you to numerous restaurants, museums, bars and shops. The Big Dig has brought many improvements to South Boston over the years, namely the addition of a new transportation network, new hotels and new office buildings, as well as the Boston Convention and Exhibition Center and the Seaport Hotel and Seaport World Trade Center on Commonwealth Pier. Heading to the City Side/Artist District, you can visit the Fort Point Artist community, known as New England’s largest artists’ community, home to more than 300 artists. The East side is going through its own growth spurt with plenty of new developments and renovations, punctuated by an increase in property values because it's so close to downtown Boston. The West side has convenience on its side -- particularly those who require daily access to the heart of Boston, such as those who work in bustling Downtown and the Financial District. Thanks to two Red Line “T” stops (Broadway and Andrew Station), you can get from your home to downtown Boston fairly quickly without having to navigate a car and find parking. With the addition of new luxury condos, retail shops and restaurants, this area is quickly transforming into one of Boston’s premier neighborhoods without the premier neighborhood price tag. Getting in now will pave the way for your establishment in this neighborhood. Incidentally, did you know the West Side boasts the first Green Residence (Gold LEED Certified) in Boston? It's called the Macallen Building and it was seen in the film "The Greening of Southie." Other notable films shot here include "The Firm," "Good Will Hunting" and "Black Mass." Heck, you can even fill a day hitting all the famous film scenes from those movies and many more! Need more reasons to love South Boston? How about Castle Island, Harpoon Brewery, Independence Square Park, Murphy Memorial Rink, Bay State Cruises, and Halifax County Museum of Fine Arts? If you choose 14 West as your new abode, you'll be up close and personal with a variety of coffee houses, sports bars, bakeries, taverns, trattorias, pizza joints, fish markets, fine dining establishments and farmer's markets. You'll never be at a shortage on where to eat, what to do, and how to have fun -- especially in such close proximity to Boston, where the entertainment and recreation possibilities abound. 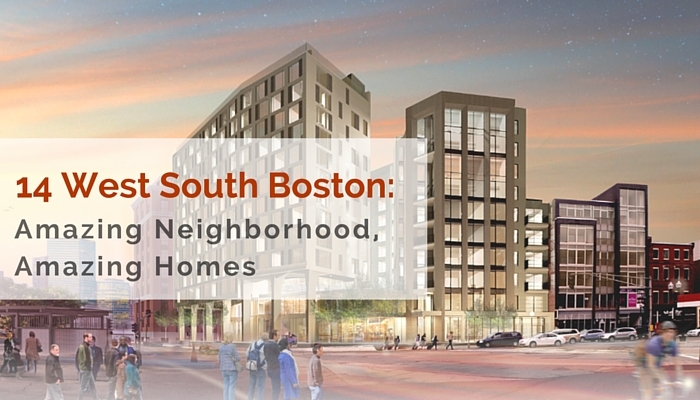 Living right here in South Boston is convenient, to be sure, but consider that you're also a part of history in the making. 14 West is just the beginning of luxury living in South Boston! Come be a part of it and get in now before the units go fast. Want to call 14 West home? Give Elevated Realty a call at 617-701-6300 or email info@elevatedboston.com. We are a full-service sales and leasing brokerage, focused on the Greater Boston Metropolitan Area, boasting experience in leasing, property management, land development, acquisition and other areas of real estate. If you're looking for a one-stop-shop when it comes to real estate, we are the clear choice. As a locally owned and operated company, we are deeply invested in this community, with a history of developing a large network of trusted professionals so you always get the best service, whether you're in the market to buy, sell or rent a home in and around Boston. Based at 753 East Broadway on the 3rd Floor in South Boston, we here at Elevated Realty look forward to speaking with you about this amazing new opportunity. Get in touch today and speak with one of our qualified professionals who are standing by.